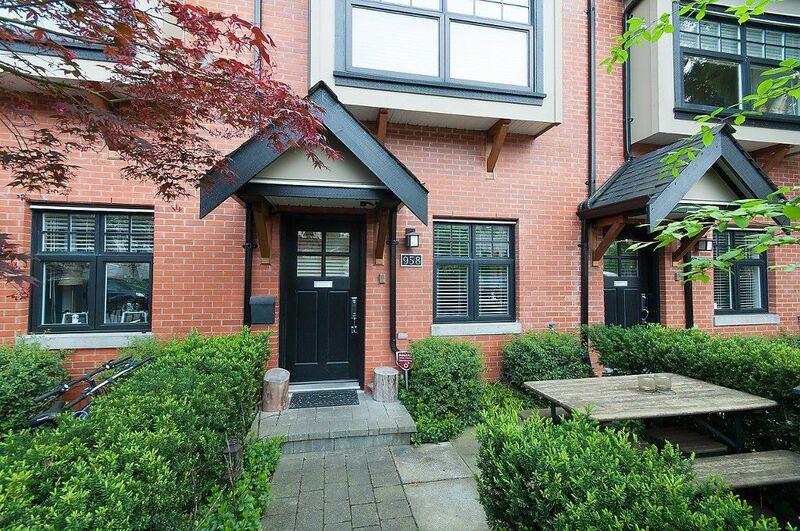 Boutique 3 level brick townhome on tree lined street in Fairview Slopes! Built in 2008 as a 6 unit complex, this beautiful city home at the CLASSIX has an open concept floorplan with 2 bedrooms & den. Main floor boasts spacious dining & living rooms, and chefs kitchen with adjacent south facing balcony with gas hookup. Incredibly bright with large windows and lots of modern finishes throughout including high ceilings, recessed lighting, bamboo floors, undermount sinks, and Fisher-Paykel appliances. Two large bedrooms upstairs and bathroom with separate shower. Additional Den/Bedroom & full bathroom on lower floor. Attached garage (13 x 18) could converted to usable square footage as there is lots of street parking. Location cannot be beat: close to schools, parks, shopping, restaurants, & transit. Walker & Biker’s Paradise with scores of 90 & 96 respectively. Top quality construction & still under warranty. Your new home awaits!